Its the end of first term here at Jakarta International School. With that comes lots and lots of report writing. Report cards, assessment reports, progress notes for my RtI kids, ILPs (IEPs in the States), etc. And so many meetings. So. Many. Meetings. This is my roundabout way of saying that I fell behind in planning for my early childhood kids this go-round. Yesterday afternoon I suddenly realized I had no book, no lesson plan, no yoga poses, and no activity planned for the next day. Frantically I ran to the library to see if I could find any seasonal, non-Christmas books to fit the bill. 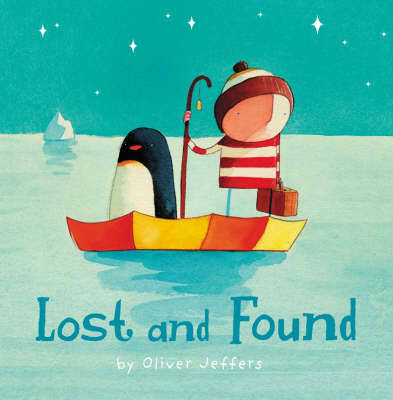 In the process I rediscovered Oliver Jeffers’ Lost and Found, about a lonely little penguin who befriends a young boy. The boy rows the penguin all the way back to the South Pole only to realize that the penguin didn’t want to go home - he just wanted a friend. I had about 30 minutes to figure out what to do with this book with my little ones. I scanned through and figured that we could do a quick picture walk/yoga sequence with “penguin pose” (feet in ballet first position and arms at the sides), “house pose” (arms over the head with hands forming a point), bird pose, boat pose (with rowing action), and “wave pose” (arms up and then forward into a fold forming the motion of a wave). So. Book chosen? Check. Yoga/movement sequence planned? Check. Activity? Activity…? Activity…..? I turned to my good friend Google for penguin-y activity ideas, and came up with the idea to play “lost and found” with a penguin crafted from a toilet paper tube, construction paper, and googly eyes. Two kids would leave the room while I hid the penguin, and the other kids will help the seekers find it by telling them if they were hot/cold. Brilliant! We could work on opposites, such as warm/cool and hot/cold, as well as more descriptive words like freezing and burning. Today was my “guinea pig” lesson - the first of the new cycle. Hmmm. It’s the end of the year, it’s a Friday, we had a special assembly today, and everyone is equally amped and exhausted. Needless to say there was a lot of “everyone back to the carpet!” and “once more, we don’t tell the seekers where the penguin is - that ruins the game!” and “are they warm?” being shouted by me over the noisy din of 13 4-year-olds. My voice is on its way out - and I have five more of these classes to teach! That said, the kids had a blast “rowing” through the ocean. They were so enthusiastic about telling the seekers if they were hot/cold. At the end, some of the boys came up with different variations on how to play the game, and another little girl was so excited to teach her mom. My guinea pig classes are always fun and definitely help guide me for the next 5 classrooms. With the next class, I will do things a bit differently. For instance, we might go outside. The classroom was full of things they tripped over in their excitement to play. I will explain the rules more specifically, as well as the idea of teamwork. If you have a partner, work together. If people are giving you clues, make sure you listen to them. But overall it was a successful lesson considering how quickly I planned it. Good to know I can do these things in a pinch now that I have some more experience under my belt! For EC2, we did the original activity and it worked much better as all of the kids who were giving the “hot/cold” clues had to stay on the carpet while the two seekers looked around the room. This eliminated the problem of kids giving away the hiding place. It was very sweet as they all cheered each other with great enthusiasm!